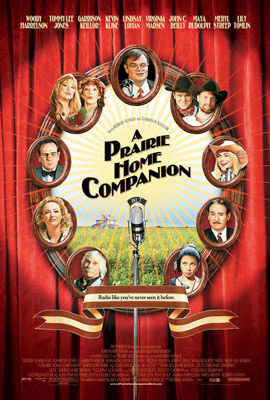 That said, what a lovely, funny surprise Prairie Home Companion, scripted by Keillor and directed by Robert Altman, makes as a movie! The film glides between the live stage performance of the titular musical variety show, hosted by familiar, owl-browed emcee “G.K.” (Keillor, big and stooped, with a broad red tie that hangs down to zipper-level), and the show's backstage scramble involving performers, producers, and personnel at St. Paul's Fitzgerald Theater. Routines reappearing tonight include a singing cowboy duo, Dusty and Lefty (carry-overs from the radio program, played here by Woody Harrelson and John C. Reilly); the Johnson sisters, Yolonda and Rhonda (Meryl Streep and Lily Tomlin); and country warbler Chuck Akers (a touchingly faded L.Q. Jones), all backed by The Guys All-Star Shoe Band. As per Altman tradition, the actors sing live, with their own voices, and through a full program of songs: Jones gladly lets go the gray wisp of his voice to the Carter Family's “You Have Been a Friend to Me,” Streep can really sing (and does), Keillor drops by to harmonize. Everything works, first and most importantly, on the level of a flat-out entertaining hootenanny — you want to shake the performer's hands on the way out. Dusty and Lefty's cheeky song “Bad Jokes” is dumb and crazily charming; Tom Keith's sound-effects man one-ups Police Academy's Michael Winslow; everything is in good, cornpone fun. Away from the stage-enforced coherence, the theater's wings are a jostle of period-piece eccentrics, all drawn together by the larger anachronism of a still-broadcasting radio variety show (“the kind that died 50 years ago”) circa Right Now A.D. Theater security Guy Noir (Kevin Kline), introduced as he leaves a Hopper metal-box diner, is a pin-striped putz who talks hard-boiled Chandlerisms and pratfalls slapstick. Yolonda and Rhonda's many-mirrored dressing room is a museum of faded postcards and tonics that haven't been produced for 40 years where the gals yammer about back-remember-when they were still a family act and about doin' the county fair circuit, while Yolonda's sour teenaged daughter (Lindsay Lohan) sulks and writes gloomy poetry on her jeans. The movie's pretext for plot comes in the threat of the pitiless changed times crashing in on this biosphere of outmoded Americana. The show is newly under the controlling corporate interest of Texas real estate, entirely indifferent to “Prairie Home”'s sense of tradition or of community, or indeed to anything but the bottom line (a double feature with Weird Al's UHF seems apt). The revelation is slow to spread, then staunchly ignored, that this will be the final broadcast. A terse overseer of the Texas firm, the aptly named Axeman (Tommy Lee Jones), drifts into the theater as the show's winding down, surveying what will soon be surface parking. He's never heard of Scott Fitzgerald. He doesn't have time to read romances. In a largely laudatory appraisal of Prairie Home for the most recent Film Comment, critic Kent Jones postulates that something of the film's serene charm comes as a result of Altman escaping his compulsion to court “contemporary relevance.” I'm not sure I agree. The director has quantified himself, many times, in as many words, as some kind of political filmmaker, and his life's work is full of movies that buzz around specifically American phenomena. So often the cross-pollination between performance and our national myth-making process is built into his work; it's in the way Jennifer Jason Leigh in Kansas City lifts her tough-cookie moll act, intact, from the bottom half of cheapie gangster double-bills; it's in Nashville's turgid Bicentennial overture “We Must Be Doing Something Right (To Last 200 Years)”; it's everywhere in Buffalo Bill and the Indians. So I'm not convinced that Prairie Home's amiable “Let's put on a show” bobble is quite apolitical. The movie's assertion is that America is being drained of its idiosyncrasy, and the implication is that those responsible are mostly Texans who don't have time to read romances or, to borrow the definition of Republicans by the suspiciously Keillor-like narrator of Keillor's recent novel Love Me, “bullet-headed ideologues devoted to prisons and sterile office parks and McMansion developments.” Which is why I was a little unsettled to see Madsen's angel finally intervening on the side of G.K. and his merrie band, taking care of Axeman, if not of the insurmountable interests he represents. I've always been a bit wary — thanks to that Zimmerman kid who declared that “the country I come from is called Midwest” — of those people who claim to “have God on their side.” We Midwesterners are just like that, I guess.